This unique photograph was taken outside Rawlins school gate. The year is almost certainly 1914. On the back of picture, it says ‘Lads of Quorn village, outside grammar school’. The only person that can be identified at present is Rowland Williams, back row, first left. Rowland was the youngest son of Israel and Frances Williams and in 1914 the family were living on Barrow Road. It is interesting that two of the lads are already in uniform, presumably ready to go off to fight in the Great War. The more you examine this picture, the more interesting it gets. These are just ordinary village lads, and it is fascinating to look at (for instance), how they were dressed. 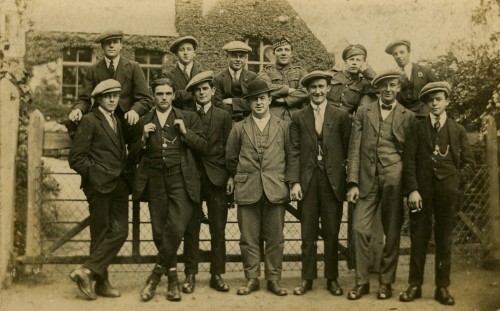 They seem to all be wearing boots, all but one has a hat or cap, they are all wearing waistcoats, most have 'Alberts' (a pocket watch and chain) and one is wearing bicycle clips. The museum team really hope that some more of these young men can be identified.